Linda J. Armstrong has a broad background in education as a classroom teacher, early childhood program administrator, trainer, consultant and adjunct professor. 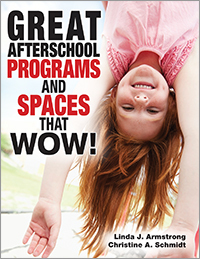 She holds three degrees in education, is the author of Family Child Care Homes, and coauthor of Great Afterschool Programs and Spaces That Wow! Linda is the former cochair of the Association for Childhood Education International (ACEI) Early Childhood Committee and recipient of a Phi Delta Kappa grant for action research. She has been awarded U.S. Army and Air Force medals for her contributions to their children and youth programs and the Irving Rubenstein award for the U.S. Army New Manager of the Year. Today’s children are plugged in to an overabundance of fast-paced electronic games that promote individual play and connect young children to screens, not people. 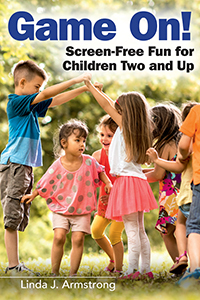 This book is a collection of screen-free, traditional games and activities for young children that require nothing more than people and their brains to play. All games and activities are adaptable according to the age of the children, their interests, and their abilities. Promote the comfortable feeling of home, support children's needs, and maximize learning experiences in your family child care setting. Filled with wisdom from an experienced family child care professional, Family Child Care Homes includes knowledgeable suggestions for item selection, furniture arrangement, storage, and more. 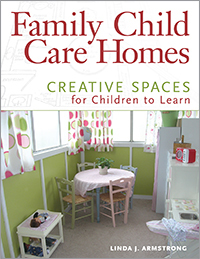 Loaded with color photographs and architectural illustrations of indoor and outdoor family child care settings, this resource provides plenty of inspiration and practical information to create a comfortable, home-like setting that benefits children of all ages.